Holland Saints out of Trelawny continued their impressive early season form with a stunning 81-68 victory over former champions Catherine Hall All Stars while Montego Bay Cricket Club Knights and defending champions Granville Jaguars stayed perfect in the Western Basketball Association Elite League at the Montego Bay Cricket Club. Saints, with the shock victory, made it two-from-two, improving their points tally to four while sinking the All Stars to their first defeat of the campaign. Errol Steele of the Saints engineered the demise of the All Stars team with a solid 29 points, while influtential player/coach Ricardo Brooks added a double-double, 18 points and grabbed 12 rebounds. A third player, Aldane Anderson, added 19 points. Saints were ahead by ten at the break, after winning the two opening quarters 16-13 and 20-13 for a commanding 36-26 advantage. With their offence spearheaded by fast break points, interceptions, penetrations to the basket and timely three-pointers, Saints continued their forward march by adding a further 45 points in the second half as All Stars pressed, themselves scoring 42. Michael Schloss had 22 points in a losing cause for the All Stars with two others getting into double figures as Mikhail Smith added 11 rebounds. 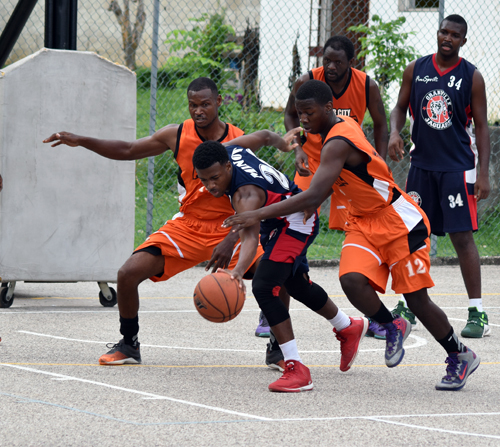 Meanwhile, Cricket Club Knights collected a third victory, putting out Lucea Flames 74-66. Flames were on fire in the opening seconds of the encounter, putting six unanswered points on the board before they faded out as Knights got going and into a rhythm, outscoring them 17-8 storming to a 37-26 halftime lead. Knights were in cruise mode thereafter, storming to the victory with minimum fuss as they dictated the boards and dominated their opponents in the paint, using screens and high pick and rolls. Captain Jhuan Bryan led the way for the Knights with a solid team-high 18 points and grabbed 9 rebounds, while Antonio Spence and Daniel Malcolm added 15 and 10 respectively. Spence also had six rebounds. For the Flames, Junlian Walker soared for a game-high 19 points, with Jvon Calderon adding 15 and hauling down 11 rebounds, while Sheldon Myrie supported with 16 and 7 as Flames sank to a second successive defeat. In the meantime, defending champions Granville Jaguars, though not at their best, pulled off a 68-52 victory over a spirited Inner-City Avalanche. Avalanche had three players in double figures and had the chance to pull off a stunning win, but wilted under the pressure of a charging Jaguars team who dropped ten straight unanswered points and forced four turnovers as they closed out their third straight win, remaining undefeated. Team leader Dane Morris and Kaniel McKenzie with 12 and 11 points were two of the three players in double figures for the Avalanche. Youngster David Gordon, 19 points and 8 rebounds, and Cleon Morgan 17, led the charge for the Jaguars with Dave Black, 10, and Tafari Vassell 15 rebounds, offering assistance. The League continues on Thursday with a solitary match at the same venue.